For most beginners, let’s all admit packing for a long day’s travel is our worst nightmare because we have no idea what are the necessary items to have on hand when a certain situation happens. For the most part, it’s because we haven’t experienced worst case scenarios yet which we should all be thankful for. But let’s say (theoretically speaking) that the end of the world is about to happen, ask yourselves this – Am I prepared for it? For any of this? I mean some of us would answer truthfully – No, I’m not. That’s a good thing, but the worst part you can do is not taking any action to remedy that. So, make better of yourself and prepare for the unpredictable. The world is ever changing so it’s best to adapt along with it. So aside from your clothes, important personal documents, cash, and phone, here are some of the ten travel items you need ready when, or if, the world is about to go rogue! Your mode of transportation should be secure, in good working condition and ready to go. Logically, you want your car ready and filled with gas. Stocking up on fuel is a must! Gearing up your Toyota Vios in the Philippines is a good tactic, especially the habit of making sure that it doesn’t reach the low level of its fuel meter. This will save you from a lot of trouble in the future if you are constantly making sure to check on its fuel level. This is quite necessary when you are stocking up on your rations since some foods will be inedible and rot once they are soaked wet. Storing your food in waterproof containers will make sure that it’s preserved. Air tight containers are also equipped in housing your food supplies so that ants and other insects cannot contaminate it. Other than having a good supply of water for staying hydrated, make sure to also have water purification tablets because when your water supply runs out, you will need to find a water source and you will thank yourself later for having those tablets ready. You’ll need a heat and light source for when the night goes dark and cold and these three items can very much provide you with fire. In addition, teach yourself how to make fire with the use of sticks or stones like they do in survival guides. You will need some form of protection and with a swiss army knife safely secured in your pocket, traveling will be much safer. Swiss Army knives also vary in size, but with that, make sure to also have other forms of protection with you just in case. Crowbar is a handy tool to have. You can use it to prop open cases and sturdy materials. You will likely use this most of the time when you are in urban or city areas. Having a small axe like hatchet is useful to have when you need to make shelter. This tool can also help you out while you are hunting for food, or gathering wood and other supplies that will require you to cut through and chop down thick branches. There you have it, all the must-have ten items for when the world has changed to ‘The Walking Dead’ setting. 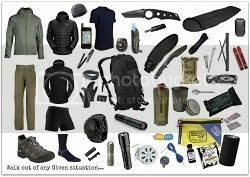 2 Comments on "Travel Items That Will Help When SHTF"
Did not include the most important item for protection – firearm(s). I am sorry you feel that way, but to many, it is not a useless list. As far as your question….most people already have protection so I am sure the writer did not feel the need to include that since it is already in millions of articles out there. But that is just my opinion. Please feel free to enlighten the readers with your opinions on which protection they should include in their travel items.